The Blockchain for Livelihoods from Organic Cambodian Rice or Blocrice involves developing a “smart contract”, a three-way digital contract farming agreement between organic farmers, rice exporters and retailers. It enables all parties to digitally facilitate, verify and enforce the negotiation and performance of a contract. The one-year Blocrice project involves 50 small-scale organic rice farmers in the central north province of Preah Vihear. It was introduced In April by Oxfam, an international non-profit organisation. These farmers have land sizes averaging between one to two hectares and produce 2.5 to three tonnes of organic rice annually. The project registers all components in the supply chain with unique identification codes on blockchain. It then introduced a smart contract between all parties. When the produce is delivered, the acceptance will be digitally recorded and payment will be digitally transferred to agricultural cooperatives who will then transfer payment into the farmers’ personal bank accounts provided by a local bank. With the accountability and transparency offered by blockchain technology, traders, manufacturers, and retailers can access information on the supply chain in their shared database, from the planting to the manufacture of rice products. Data generated by this program can be analysed to find ways to strengthen local agricultural communities and improve their living standards. The farmers can be empowered to find buyers and negotiate better prices. Previously, the rice farmers lacked the power and information to negotiate with middlemen and traders, and were often pressured to sell their produce quickly to repay high-interest loans. “This project involves the participation of a large network of stakeholders who have to agree to work together and to the terms of a Smart Contract that ensures everyone receives a fair share of the deals,” said Solinn Lim, country director of Oxfam in Cambodia. “Every transaction must be transparent, traceable and verifiable by all parties. “Building trust among key stakeholders is key. The project has made partnership agreements with all relevant partners including the Agriculture Cooperative, export companies, partners and private banks to facilitate cashless transactions,” she said. To ensure the web-based Blocrice application is accessible to all farmers, various interfaces are built-in to allow access from analogue phones, she added. Blockchain is used as a decentralised, distributed and public digital ledger to record transactions across multiple computers. Records cannot be altered retroactively without the consensus of the network. Therefore, all parties in the rice supply chain - from agriculture cooperatives to the rice cake manufacturers in Europe - will share relevant information. Oxfam is involved as a broker for fair contracts between all parties to make sure the farmers receive an equitable income for their labour. The contract is processed into a smart or digital contract on blockchain. The contracts ensure all social, environmental and labour conditions are respected by all parties. By the end of the project, Oxfam hopes that the digital contract farming agreements will be fulfilled correctly, which each farmer getting paid their fair share and on time. If funding from donors can be secured, Oxfam hopes to scale up the project to include another 24 agriculture cooperatives that represent over 4,000 farmers. Oxfam ran a Blocrice workshop on 31 August for other agriculture cooperatives in Preah Vihear, along with the provincial government and private sector companies. Rice exporter AmruRice, one of the parties participating in the pilot project, is hopeful that fair trade can improve the image of Cambodian rice and promote exports. 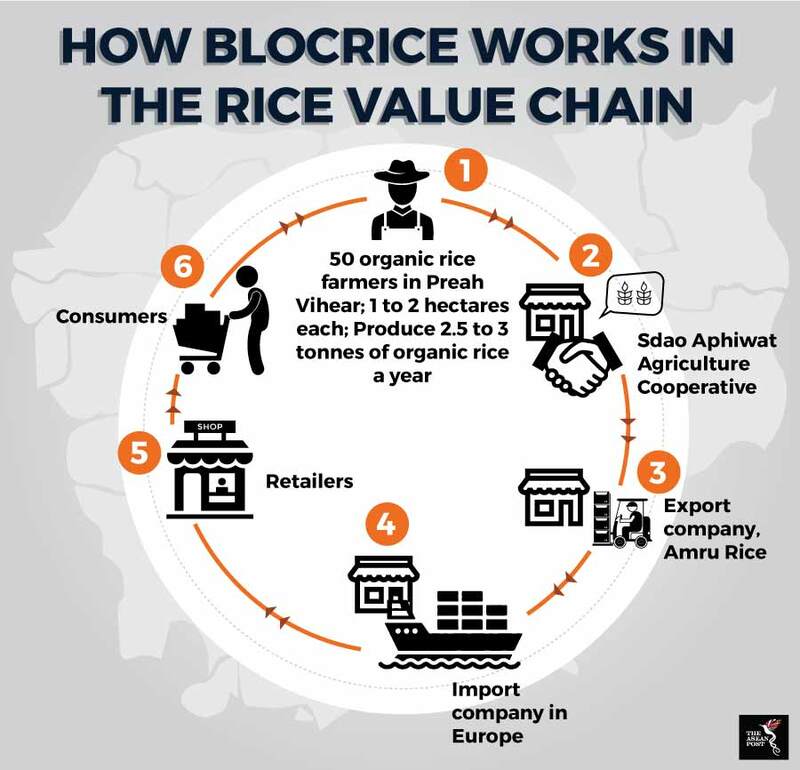 “Foreign retailers can access Blocrice to trace where the rice comes from and monitor if their trading partners are treating farmers fairly,” said Kann Kunthy, AmruRice managing director.